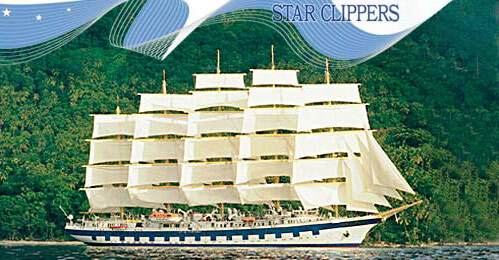 Star Clipper Cruises - Just Cruises Inc. Discover a new age of sail, where the traditions of the past are combined with the modern comforts and amenities of the present. 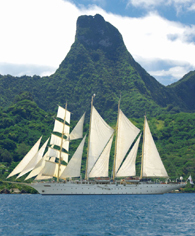 Star Clippers Tall Ships are perfect for cruising in casual elegance. The Mega Yacht Iitineraries range from the sun-kissed Mediterranean to the exotic Far East and the Caribbean. On board you will enjoy a relaxed atmosphere, friendly crew, and international cuisine, all in pampered comfort. If you're a boating enthusiast, you can choose to lend a hand hoisting the sails, you can climb the mast, enjoy water toys from the watersports platform or you can just lay back and let the crew do all the work. Inspired by the legendary Tall Ship, Preussen, the star Clippers flagship, the Royal Clipper has the proud distinction of being the largest and only five-masted sailing ship built since her predecessor was launched in 1902. The Royal Clipper Boasts 42 Sails.